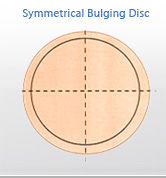 The term "bulging disc" is and should be used as a descriptive term, not a diagnostic term. Here is a birds eye view looking down onto a disc. Notice in the diagram the outer ring, this represents a symmetrical bulging disc. The disc tissue is bulging out around the entire border of the vertebrae. This is a rare finding under MRI and CT scans. Although bulging disc is a popular term, it is usually not representative of what is really going on at the spinal level. It is used because it is easy to understand. Most people really have a herniated disc. This condition is sometimes referred to as internal disc disruption. This is very difficult to see on MRI or CT scans and is considered to be the early stages of a herniated disc, although it is still not visible on advanced imaging. This condition responds well to non-surgical spinal decompression, allowing blood, water, and nutrients to enter the disc and begin healing the damaged annulus fibrosis. Please see the diagram below. Non-surgical spinal decompression can be very effective in treating these difficult conditions. 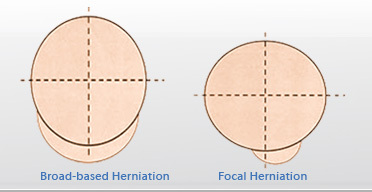 The treatment results in an unloading of the offending disc structures, which in turn creates a negative intradiscal pressure inside the disc. This facilitates water and nutrient exchange into the disc, thus, allowing the injury to heal. It also can cause a vacuum-like effect, allowing the displaced materials to return to a more centralized position. Over time, this treatment allows collagen, one of the bodys healing proteins, to form. Collagen can then repair the cracks and fissures in the annulus fibrosis. In addition, the inner matrix material of the disc becomes healthier with the exchange of water and nutrients. Spinal stabilization rehab exercises should follow a common sense spinal decompression therapy program.